We recently had the fun of escorting our pastor to a skydiving event where she was to jump out of an airplane as a fund raiser for our church. No, we weren’t trying to get rid of her, nor was it her first time exiting an airplane that way. I’m happy to report that the event was a success in every way; not that we expected otherwise. But that’s part of what my thoughts here are about. We skydiving enthusiasts flippantly repeat the assurance that a car ride to the airport is more dangerous than an actual skydive. It set me thinking, though, about how undefined or open-ended such a claim is; and beyond that: Is there a prescribed Christian response for how statistics should influence our decisions in the first place? I’ll start in with the statistics of this particular claim. To be fair to both activities, it would be interesting to know in terms of fatalities: how much skydiving is equivalent to how much driving? So I looked up the necessary statistics – just for the United States, where both air and road activities have some consistent regulation about them (not to mention that these were the first statistics I found). Considering fatalities alone, which is the question that interests most people about a skydiving event—what are my chances of surviving—this becomes easy to calculate. Yes, it does overlook many other possible injurious but non-fatal outcomes for both driving and skydiving incidents, and No; skydiving is not a non-forgiving sport where any little mishap leads to near-certain death. But since the more frequent occurrences of mere injury or property damage muddy the waters considerably on both sides, we will keep our waters as clear as possible and stick to the question of interest: will I survive? 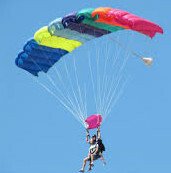 According to the United States Parachute Association (here), 3.2 million skydives took place in the U.S. in the year 2013. From those, there were 24 fatalities. This means if you were one of those jumpers, your odds of surviving each single jump were about 133 000 to 1. And lest anyone wonder if 2013 might be some anomalous year in that respect, averaging the last three years together yields a result not much different (138 000 to 1). And indeed that is reflective of the entire last decade, other than to note a general and gentle trend towards fewer fatalities in recent years compared with those years farther back –not surprising in a sport that is increasingly safety conscious. So … by itself that sounds fairly reassuring. Using our “133 000 to 1” as a baseline comparison, we can turn our attention to automobile safety. According to the National Highway Traffic Administration (here), there were 1.13 fatalities per 100 million vehicle miles traveled in the year 2012 (the last year for which data is shown). That too, is very representative of recent years, other than to note that here too is a gentle trend toward more safety over the broader sweep of a decade or more; so I’ll use the 2012 number as it stands for our comparison. Taking the number of miles driven per fatality and dividing that by the number of skydiving jumps per fatality, we see that the odds of surviving a single skydive are the equivalent to the odds of surviving a 670 mile drive. So a claim that there is greater chance of death on a typical commute to a local airport than in one skydive is actually in error, attributing greater danger to the commute than is warranted. 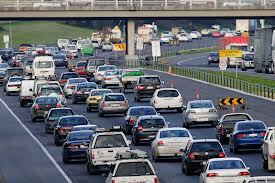 Odds of traffic-related death are probably reduced while one is parked on the “freeway”. On the other hand, those sky diving enthusiasts who took the trouble to define their claim (I found one case), noted that they were favorably comparing a skydiving event to ten thousand miles of driving. That claim is correct; since those accumulated commutes are about fifteen times likelier to kill than one sky dive. Given how much driving most of us do without much thought year-in and year-out, there is still considerable truth in the comparison as long as we don’t over-dramatize it. And in all fairness, it needs to be noted that skydiving hobbyists typically do multiple jumps in one day, just as we all drive multiple thousands of miles each year. And each event on both sides is a fresh participation in the fatality “lottery”. This all had the curious effect of actually giving me pause about the safety of skydiving, given my own sober appraisal of driving dangers. I do not consider a 670 miles worth of commutes to be of trivial risk. Or conversely, I could choose to feel reassured about the safety of driving given my comfort with the notion of skydiving as a sport, and the paucity of fatalities involved. But all this is to miss an important point. We do not helplessly submit our lives to statistics. That is, even if we armed ourselves with the knowledge that a million pedestrian road-crossings happen without serious incident (and I’m reasonably sure that it would actually be much more than a million if we were to find an actual number) we would not then, on the strength of our newly embraced statistic, adopt a cavalier attitude about crossing roads, neglecting any care or attentiveness. Any such road-crossing carelessness would undoubtedly put us into an entirely different probability pool than the one enjoyed by a more careful public. Likewise in all activities such as driving or skydiving, we exercise a lot of control over how those events unfold, making us far from passive participants in some impartial lottery. If we make a poor choice (as I have done before) to continue driving while fighting off sleep, then we are delusional to think we are still enjoying the same odds drivers generally enjoy. The real game we’ve chosen to play may be much more grim. And it could also have much improved odds if we choose to exercise better-than-average habits such as cutting back on excessive driving speed or maintaining equipment well. We constantly do things to increase chances in our favor, as it should be. Another question can also be explored on the theological front: Do Christians have any business attending to statistics regarding matters of survival while at the same time believing in an omniscient and sovereign God that has fore-ordained all things? Shouldn’t we just be trusting that all is in God’s hands, and that as such, there is no such thing as chance or luck? Obviously we’ve already answered this question in a practical sense by how we live – we very much attend to everything we can insofar as it rests on us. We don’t bow our heads in fervent prayer as we cross the street, petitioning the Almighty to prevent us from getting run over. No –we wait, watch and cross with our eyes wide open in full knowledge that it would just be plain stupid to do otherwise; and we do so without any hint of apprehension that such attentive care should somehow be antithetical to a life of faith. All activities are analogous to this, their frequency, danger, or necessity all differing only in degree. Regarding matters of “chance” beyond our control, we see examples of trust in God’s sovereignty, as well as examples of people who sought verification and were not always reproved for it. Our work to reduce what is left to chance and to extend our perceived (and real) domain of control could, I suppose, be interpreted as a lack of trust — after all, isn’t chance under the exclusive dominion of God? But this is a hard case to make when we are doing no more than what so many through Scriptural history did and were presumably expected to do: working and preparing to meet the known circumstances of each situation as best they could. A notable, perhaps exceptional category would be when lots were cast as a means of seeking Divine input for a decision. Sometimes the field of choice is left wide open for the lot, such as when Achan was chosen out of all Israel. Other times, the field of options was narrowed beforehand, such as when two candidates deemed worthy were put forward as disciples to replace Judas. Why the imposed restriction to two? Couldn’t God be trusted to select the right person from the widest possible field? Here we see an apparent mix of human and divine agency which may then reveal this fallacious dichotomy in better relief. The disciples were not reproved for not trusting God with a larger slate of candidates. It would seem that here, as in so much else of Scripture, God is working through both the known and unknown; sovereign over the whole process, not just the “chance” part. Human agency, regardless of one’s position on free-will, is not exempted from God’s sovereignty. The disciples discerned who the suitable candidates were, and then trusted God to complete that selection process. We use our minds. We also trust. All under the guidance of the Spirit. While some characters in Biblical narratives or parables exercise an expected resourcefulness, others may appear to attempt the same but earn a rebuke for not trusting God. Jesus, in parable speaks with approval of the prudence of counting the cost and assessing whether or one can successfully engage the task. Yet when Abraham and Sarah took matters into their own hands about how they might go about securing an heir, there is an implied rebuke in the resulting circumstances that unfolded. Or as a more explicit example, David is warned about trusting in the armed might of Israel instead of in God. The exultations of Hannah are later echoed in the song of Mary as we are reminded across the Scriptural ages that neither by might nor riches will man prevail. “Lean not on you own understanding” writes Paul, reminding us that even after exhaustive effort on our own part, there will always remain heavy lifting to be done by faith. Merv has been a teacher at Flint Hills Christian School since 1993 and has also been active with his family in Manhattan Mennonite Church. Science and faith issues have long held his interest both personally and professionally, and he is passionate about cultivating a more robust intellect among the wider Christian community in the service of Christ. This entry was posted in Merv Bitikofer, Theology. Bookmark the permalink. Thanks for this thoughtful piece, Merv. I have two memories of statistics regarding fooling around with gravity. The first was a notice at the airfield where I went for a flight in a vintage bi-plane that said, “Contrary to common belief, flying in small planes is more dangerous than driving…” (a disclaimer followed). I figured that was fair enough – I’d done 60 years so I couldn’t complain. The second is about a hospital in Scotland near an airfield where many novices do one-off sky-dives for charity. Somebody had worked out that the cost of treating injuries was a lot more than the money raised for causes! But that kind of underlines the point that such statistics aren’t to do with unavoidable bad luck. I was trying to think, more seriously, of where lies the flaw in the argument that since chance is within God’s providence one might leave it up to him. I guess the answer is that stats on skydiving accidents, say, are not about divinely governed randomness. They’re actually about the frequencies of someone not folding their chute carefully, not noticing a worn or sticky fitting, not landing properly etc. In other words, there is in fact a set of causes to any accident, so the careful and skilled jumper comes under a better set of odds than the overall figure. Errors or causes one couldn’t anticipate are not necessarily blameworthy – they just count more when you’re jumping out of a plane than when you’re tying a shoelace. Of course it’s legitimate to pray that God will cover any human errors, mechanical failures and so on – or indeed that he’ll enable you to spot them and avoid them. But as you rightly say, God is no more (but no less) involved with “chance” than he is with events that are predictable and, indeed, the things we do voluntarily either trusting in his will or failing to do so. It would be a pretty bizarre life if we seriously believed that chance is independent of God, wouldn’t it? We’d only pray for things that we knew were going to happen anyway! I can’t speak to aviation –especially on vintage aircraft. But looking *way back* as in three or four decades ago, the sport of skydiving was much more dangerous if available statistics are any indicator. Here in the U.S., the sport has really come into its own attracting folks who never would have considered it before; and as such has become very safety conscious –although it may be a “chicken or the egg” question as to whether its increased safety spawned its popularity or vice versa. I wouldn’t be surprised to discover that aviation too has improved its overall safety record over the decades as nobody likes big press about plane crashes with lots of death. I have heard attendants on large airliners claim that per passenger mile traveled, they are safer than auto travel. I’ve never checked into that statistic, but I have no reason to doubt it. Air crashes make big news when they happen. Car accidents don’t. Regarding how I can know if the grass in my lawn is getting taller or the universe is shrinking … I’m happy to report that either my grass is shorter, or if my lawn turns out to be the standard constant, then the universe just made a quantum leap to bigger size again. Did you feel it? Local variables Merv – only your bit of the cosmos grew, but mine stayed the same. Only there’s no way of measuring that so you’ll have to take my word for it! Relativity rules, OK? Thanks for your kind words, Eddie. That’s high praise coming from you. Interesting post, thanks. I shall remember that it is safer to jump out of an aeroplane than to drive from Land End to John O’Groats (881 miles). If I believed that God has fore-ordained all things then survival statistics might lose their importance. However, I think that I am not alone as a Christian in believing that God has not fore-ordained all things. So, if I get killed in a car crash I think it would not be because the event was pre-determined by God but simply because either I or a driver of another vehicle had made a mistake. Did God fore-ordain all of the sin and all of the evil the world? I think not. I appreciate that some Scriptures support the idea that God has an overarching control over all events down to the smallest detail. However, there are also Scriptures (which I will happily provide on request) which indicate that not everything that occurs is according to God’s will. Is it possible that God has the knowledge, the wisdom and the power to ensure that, even without fore-ordaining all of our actions (and whether he wills them or not), he can achieve his purposes and remain sovereign? Regarding God pre-ordaining all things … I did just slip that presumption right in there, didn’t I! And now that you call me out on it, I’m not sure I’m willing to disagree with you, though I will happily take the other end of the rope for a few playful tugs. As you may gather, I don’t feel as strongly on this either way as you or others might, and I am rather agnostic on such a thing ever being settled. But there are some who have defended rather strongly the conviction that nature does not unfold itself with some allowance of “wiggle room” that flies underneath the radar of God’s sovereignty, so to speak. The only verses I would put forward to support the notion of God’s attending to detail is the obvious reference of Jesus to the sparrow or the hairs of one’s head. But another problem that would give me pause is not so much theological, but just plain logical: I can’t fathom how “partial omniscience” could possibly work. It’s like being “half pregnant”. Omniscience (which, granted, may not be identical to omnipotence; though separating those two might also be problematic) just wouldn’t seem to function in a partial way definitionally speaking. And I do maintain a bit more strongly that God is omniscient. With the Psalmist I ask rhetorically, where could I go to get away from God? Now I do also believe strongly in free will (as I gather you do also). So those two convictions have both made elbow room for themselves in my head. While others may think those to be impossible roomates, they have with a bit of jostling and negotiation, made themselves coherently comfortable within my own worldview. All that said, I’m curious what passages you enlist in the service of your conviction that some things do happen apart from God’s will? I have pretty much the same set of questions and difficulties that you have on the tangle of ideas revolving around human free will, God’s sovereignty over events, and foreknowledge. My view, for what it is worth, is that foreknowledge by itself, as set forth classically by Boethius, does not conflict with human free will. People choose, and God knows their choices, not because he determined them, but because he dwells in eternity, not time, and in eternity all moments are present simultaneously. So he knows what you will do, because what you will do, from his perspective, you already have done. Yet never did he touch your will or compel you to choose what you chose. That would seem to resolve any problem, except for the fact that the Bible sometimes at least appears to say that God not merely knows but determines what people will choose. From the point of view of some Calvinists, this is necessary to preserve God’s sovereignty. The opponents of Calvinism, on the other hand, think that God’s sovereignty must not be interpreted in such a way as to deny human free will. This debate has been going on since the Reformation, and both sides have a reasonable point to make. The extreme of the free will camp is something like “Open Theism” — which Polkinghorne openly endorses, and many TEs flirt with (Venema, Falk, and Ken Miller all say things in that direction, even if they wouldn’t quite call themselves open theists). I agree with Jon that there are problems with this, most notably the problem that God’s sovereignty over nature appears to be given up altogether, in order to make sure that neutrons and slime molds and lobsters do not have their creaturely integrity “violated” by God’s “tyranny.” On the other hand, the extreme of the “Calvinist” position is that God’s sovereignty starts to look less like the personal relationship of a king to his people, and more like an impersonal determinism. Thus, Henry More in the 17th century rejected Calvinism because of its teaching concerning “Fate” — a term Calvin would not have used to describe his position, but which in More’s eyes Calvin’s position amounted to. I do not claim to have the wisdom to sort this out, and it may be that mortal minds never can sort it out. I certainly accept free will as a practical postulate, i.e., I will not theorize it away on the grounds of someone’s philosophy or theology. I act and will continue to act as if I can “change the future” by my choices. I’m content if God knows in advance what I choose, but I act as if it’s my choice, not God’s. But I cannot claim to have a clear answer either philosophically or theologically how free will can exist if there is an omnipotent God who has very precise historical outcomes in mind. This is not a problem for God’s control over evolution, of course: neutrons and slime molds and lobsters have no free will to be “violated.” God’s precise determination of evolutionary outcomes, then, does not offend me, as it apparently offends many TEs. But God’s precise determination (as opposed to mere foreknowledge) that I will betray my country rather than die for it, or commit adultery rather than be faithful, or apostasize rather than remain faithful — that does offend me, because it means that, in the end, my being in the image of God does not entitle me to any more consideration than a neutron or a slime mold or a lobster. In what, then, does the “privilege” of being “in the image of God” consist? I’m of the view that the Bible is subtler and richer than any of the systematic theologies derived from it — Thomist, Calvinist, Augustinian, Anabaptist, etc. Usually those systematic theologies seize upon some parts of the Bible that they regard as more important and short-change those parts of the Bible that they regard as less important. I already know how Calvinistic theologians make use of certain standard passages (hairs on the head, sparrows, Judas had to betray Jesus, God hardened Pharaoh’s heart, etc. ); what I’m interested in is the passages that tend to be overlooked. So any suggestions of relevant passages would be welcomed. Generally I agree with your comments on this subject. Additionally, we need to remember that anytime I (or you, or any Christian) begin to describe any of God’s attributes, we are caught in a dilemma – for example, if I knew in advance what you may do on a specific time and place in the future, and I had the means to manipulate events to ensure an outcome, just how would you be free to exercise your free will? This example illustrates how we are ‘bound’ within a meaning derived from the language we use. Yet often, we do not appear to acknowledge this when we indulge in a systematic theology – the above example would illustrate our human weakness, in that we may unconsciously (and by the use of our language) describe God’s attributes in terms that may equate these with human attributes and meaning. When discussing God, I am convinced that God can foreknow all things and yet allow us free choice, and also determine all outcomes in His own way. In summary, God is sovereign, all-knowing, unlimited, and yet He has also determined that we are free to exercise our will and able to choose between good and evil. Somewhere in all of this, we may be reminded that such a statement is the teachings of the Christian faith and agreed to by the Church. It is this statement of faith, and the limitations of human language, that requires a systematic theology – since we can all experience the difficulties when discussing God’s attributes – and it is this theology that inevitably points out these difficulties we are discussing here. So the next time you have to make that trip, the thing to do is to take the aeroplane from Land End, and jump out of the plane about 5,000 feet above John O’Groats. I second Merv’s request for passages. The passages that appear to say that God has dictated the course of history down to the smallest human choice are obvious enough, but, as I am not entirely won over by the Calvinist approach to this subject, I am open to looking at some passages that say or imply something different. Oh … and when you jump out of the aeroplane — remember to have the parachute on. That’s a real game-changer, statistically. Unlike Jon I am not yet retired from medical practice, so I have additional constraints on when I can get stuck into this or any other thread. I hope to do so over the weekend. Recently I have read some modern authors (Pinnock, Sanders, Helm, Ware, Olson) and have given some thought to the subject of God’s omniscience. I remain unconvinced as to whether, simply put, God knows the entire future (because he’s God) or not (because it has yet to happen). I lean towards the former. I have no concerns about God’s sovereignty being compromised by our free will. It seems to me that he can define the bounds of his authority, and if he wishes to devolve some authority to man he remains sovereign in doing so. If I act contrary to his will I have neither devalued his sovereignty nor thwarted his purposes – he intended that I should be free to disobey him. There are many examples of God’s displeasure at human behaviour throughout the Scriptures. Did he fore-ordained such behaviour, or was his anger genuine? I struggle to see how it could be both. Joseph being sold into slavery and Judas’ betrayal of Jesus are often cited as examples of God’s fore-ordination. Whilst not ruling out the possibility that God might have caused these evils to happen, I am more inclined to see them as examples of fore-knowledge used by God to fulfil greater purposes (‘he meant it for good’). Jesus taught his disciples to pray, ‘your kingdom come, your will be done, on earth as it is in heaven’. I deduce from this that God’s kingdom had not come, and his will was not being done, at least not perfectly. Else why pray for it? Jon and I had a brief exchange about this and he posted about it on 24/6/13, concluding, ‘nothing in the Lord’s prayer leads to the conclusion that his will is in any way frustrated’. I’m inclined to disagree, and there are other Scriptures which suggest that God’s will is not always done. For example, we know that Jesus died for the sins of the whole world (1John 2.2), that God is not willing that any should perish (2Pet 3.9) and the lake of fire was prepared for the devil and his angels [implying it was not prepared for men] (Matt 25.41). How, then, is God’s will not being frustrated in the case of the salvation of some men? You will conclude that in this respect I am not a Calvinist, at least not the variety that believes that God has predestined some men for eternal damnation. Jesus wept over Jerusalem. They were not crocodile tears. He was expressing the will of God the Father when he said, “Jerusalem, Jerusalem, you who kill the prophets and stone those sent to you, how often I have longed to gather your children together, as a hen gathers her chicks under her wings, and you were not willing.” (Matt 23.37). Accordingly, the fall of Jerusalem was primarily a consequence of the wickedness of its people; God’s longing to gather his people was frustrated. Elsewhere we learn that God ‘does not willingly bring affliction or grief to anyone’ (Lam 3.33). That being the case it would seem that when he acts against his will [I take this to mean his primary desires], he does so because of our behaviour, not because of any antecedent intentions. Back to risk-taking: I’ve heard it argued that since ‘A person’s days are determined; you have decreed the number of his months and have set limits he cannot exceed’ (Job 14.5) we can do nothing to change how long we live. This is Job speaking, of course, and he may have been wrong. Certainly we cannot change what God foreknows about the duration of our lives, but I do not take this to mean that we cannot shorten or lengthen our days according to the decisions we take. My answer to the question, “Isn’t chance under the exclusive dominion of God?” is that it is not, and that the sovereignty and providence of God (in which I believe) do not prevent us from taking chances he doesn’t want us to take and from suffering consequences he wants us to avoid. When Jon says that ‘chance is within God’s providence’ I would agree that God’s foreknowledge and providence take into account the fact that ‘time and chance happen to us all’ (Eccl 9.11), but with the caveat the we are capable of taking decisions that entail that we ‘fall short of the grace of God’ (Heb 12.15), receiving less of God’s goodness than he intends. I suspect that some of the tears God shall wipe away will be tears of regret that we missed God’s best for our lives, sometimes because we took chances that we should not have. I shall never sky dive (on purpose, anyway). It’s not the risk of death that bothers me; it’s the risk of exacerbating the damage to my knees acquired through 45 years of running and squash. After several arthroscopies, two partial meniscectomies and some not inconsiderable cartilage damage, I now realise that I should have been kinder to my joints. I was warned, but I didn’t listen and hoped that I would escape the consequences. I took a chance. Lately there have been a lot of very interesting and provocative posts here (including this one), and I wish I had time to comment intelligently on them. But work is keeping me busy. I hope I’ll be able to come back to them later. But I can’t resist a quick thought on these stats. How long does an average dive take? Ten minutes? How long does a 670 mile drive take? Fifteen hours? If the risk of survival for these two activities is equal, then the risk of dying per unit time spent skydiving is almost a hundred times higher than the risk of dying per unit time spent driving. I think I’ll keep my feet on the ground…. Very true, Lou! Less than ten minutes even — typically nearly a minute of free fall, and then about three to five minutes under canopy; unless you pull your chute at a crazy high altitude like I did once without thinking; on a cold winter jump too! I must have spent ten minutes up there and couldn’t feel my arms when I finally got down. But I’ll still stand behind the comparison in this sense, though: Perhaps even if the difference was 1000:1 on time alone, I’ll bet even most skydiving hobbyists have a “driving to diving” ratio of better than 1000: 1 in terms of how their actual time is spent. So while the “per time unit” lottery tickets do favor your observation that driving is safer … I’ll note that it isn’t just about the odds for that one comparison, but also how often you play each lottery. In short, with the driving you already do (if you’re live in a typical automobile society), you already put yourself in so much danger, it would be very difficult for you to skydive enough to make that death more likely. But you like all of us, have acclimated yourself to that danger, and therefore don’t perceive it as acutely. Of course, most life insurance companies do seem to agree with you on this, Lou. And one imagines they should know what they are talking about. But I think this may be one case where even they (insurance companies) gave in to public phobia more than actual information. Otherwise they would be more concerned about all the driving I do rather than making me sign a promise to never skydive. Also keep in mind… that when you speak of a risk being “a hundred times higher”, that has maximum scare effect until you realize that a hundred times higher than nearly nothing is …. nearly nothing. Yes, your last point is a good one. I think the only thing left that still gives me pause about complete agreement with you is that I think it a faulty theology if this “looseness” of will is in any way or form motivated by some desire to get God off the hook for calamities, natural or otherwise. As such, it fails, and does not even seem to rise to the dignity of being a shared concern with so many scriptural writers. They have no problem writing of God punishing peoples (including his own) with horrendous calamity. God will do what God will do and we end up precisely in the same position as Job (though minus his recognized righteousness perhaps) being asked by God: “So where were you …” So our desire to acquit God seems a misplaced concern to put it mildly. Only in the curious story of Abraham and Sodom do we have an apparent example of God wishing to justify himself to somebody. The bulk of Scripture lines up more with Job’s humble response desisting in his personal concern. Here’s a slightly oblique thought from Merv’s last comment – nothing to do with free will or risk as such. One of the arguments used against God’s involvement in affairs is not just that it’s beneath his dignity, but that it would be too much to handle. For example, how often does one hear the idea that it’s absurd that God could listen to all the millions of prayers going on at any one time and act effectively? Well, of course, juggling an infinite number of plates does seem impossible. These are vast numbers, of course, but if an omnipotent and omniscient God were fully responsible even for every event (in some occasionalist or process way), it’s a small chunk of infinity. Even a multiverse would just add a few “0”s. On what criteria would you put a bound on the capacity of the God who created the UPB itself? So “Beyond God’s capacity” is mere lack of imagination; “beneath his dignity” is a dubious human value judgement, and one has to return to theological grounds of what God chooses to do, or possibly such issues as the non-existence and therefore non-knowability of the future. Back to you guys – good discussion. The bell curves! The bell curves!